Glenn may not look like a mean guy but when he holds a machine gun then it’s better not to be in the way of this Walking Dead character. 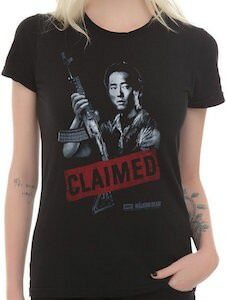 This women’s t-shirt is black and shows a black and white picture of Glenn with a big gun and in red there is a banner over it that says “claimed” I guess it was not Daryl that claimed him so then it probably is Maggie as she is his wife. You can get this The Walking Dead t-shirt in many junior sizes and yes it is made from 100% cotton. So if Glenn is your favorite Walking Dead character then get ready to get your own The Walking Dead Glenn Claimed T-Shirt.